Privy Dolls love a stylish way to protect our eyes Sunglasses are a staple and this season we have a lot to choose from. It is always safe to wear an aviator version like the classic ray-ban shades. Rumors have been circling that Lady Gaga is teaming up with UK designer, Linda Farrow. Her rep has not denied this rumor that MTV and Vogue have reported. Gaga often wears over the top glasses in most of her videos and when she is caught by her very own paparatzi on the streets. http://www.celebrity-sunglasses-finder.com/Celebrity-Sunglasses-Finder-StarShop1d.html for an easy match up of sunglasses to the celebrity wearing them. 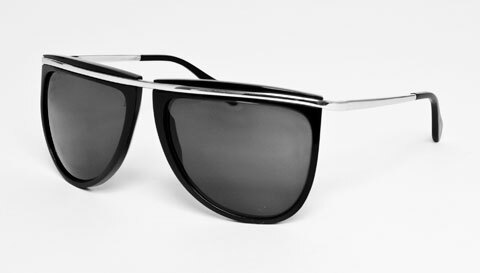 I love these new sunglasses from Balmain seen here for $595. There are a lot of great shades out there for the PrivyDoll on a budget. check out these great vintage looking glasses from Aldo for $12!! For another great find. 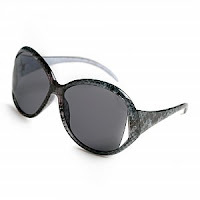 Try these snakeskin sunglasses from www.mandee.com for $7! The cut out square lens in the oversized glasses is a trend that is seen in Gucci's 2010 collection for sunglasses. These are available at Neiman Marcus for $245. Good article! We can’t see any celebrities without sunglasses. Also some of the celebrities are designers of high end sunglasses. But due to the high price tag common people can’t afford these sunglasses.